School "Miyake Taiko School" offers classes to learn "Miyake-jima Kamitsuki Mikoshi Daiko" in Tokyo area. Most part of the class is for practical training, and Akio Tsumura and his three sons give advice to students individually. 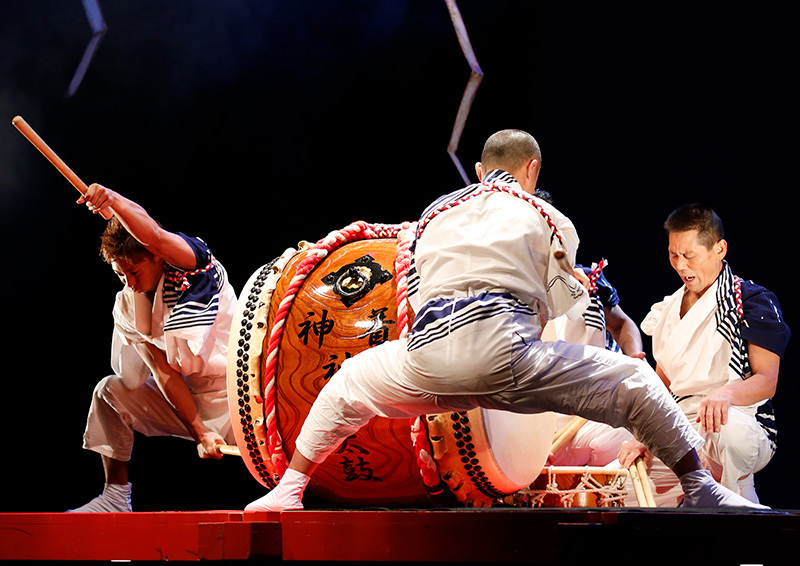 There are students with a variety of purposes such as studying Japanese taiko drum from the basics, enjoying it as sports with friends, maintaining their mental and physical health, and so on. A pay car parking is available. Availble from 08:30 to 22:00. Standard-sized car: 100 yen per 20 minutes (the fee hits the ceiling at 1,200 yen). Heavy duty truck: 400 yen per 30 minutes. At the end , please go down under the guard on the railway and turn left. Walk along the Meiji Dori. If you can see the bus stop of "Higashimukoujima-Hirokoji", it will turn left after that. Get on Seibubus to the "Shin-Tokorozawa station east exit" or "Namiki-dori-danchi" at Seibu Shinjuku Line Kokukoen station east exit. Get off at the "Namiki-dori-danchi", on foot 10 minutes. Get on Seibubus to the "Tokorozawa New Town" or "Kokukoen station" at Seibu Shinjuku Line Tokorozawa station east exit. Get off at the "New Town Chuou", on foot 10 minutes. Get off at Tobu Isesaki Line Tanizuka Station,get on the bus to the "Kuwabukuro-danchi", get off at the "Soka kinen taiikukan mae". Meguro class's fee is different from other classes for it is managed by Kyowa-kan.
Higashiyamato Shimin Kaikan "Humming Hall"
A charged parking in the basement of the Hall is available from 09:00 to 22:00 (capacity: 60 cars). 100 yen per 30 minutes (the fee hits the ceiling at 1,500 yen). Car park and cycle park of the center are available. Additionally, we provide guidance on a regular basis throughout the country. Let's Enjoy Japanese Taiko Drum with Us! Miyake Geinou Doushikai official website. Copyright © 2008 - 2017 Miyake Geinou Doushikai All Rights Reserved.